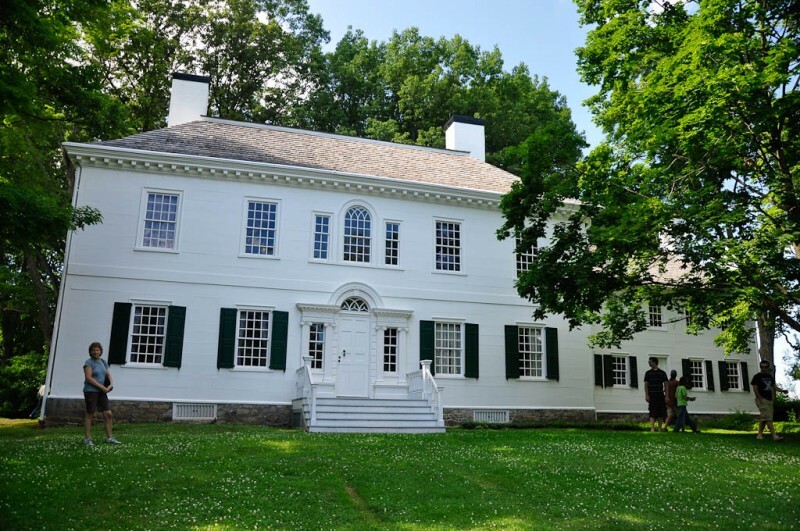 above: (left) My friend Sue waits for us to wrangle “our troops” in front of the Ford mansion in Morristown, New Jersey, George Washington’s home away from home in the winter of 1789. I would never have known that Jockey Hollow existed if it wasn’t for my friend Sue. I also wouldn’t have perfected my skills in pediatric echo if it wasn’t for her. So, after many years, I was excited to see her again. We met over twenty years ago. I had gone to Boston Children’s Hospital for training and she, being a great teacher, ended up being the sonographer that laid the foundation for my pediatric echo skills. The knowledge and skills she so unselfishly shared have served me well over my career. We also shared a very memorable backpacking trip to the Canadian Rockies all those years ago which still ranks as one of the best backpacking trips I have ever done. 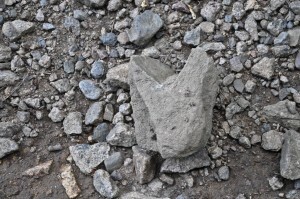 above: The Lil’ Dude spotted another heart rock. But, I soon took off for Asia and she on to medical school and our lives took divergent paths. Our busy lives since left little time for contact and before we knew it, twenty years have gone by. So, I was determined to track her down while we were in the Northeast. 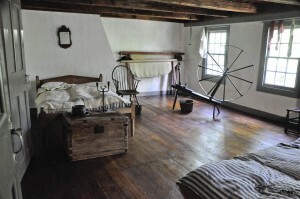 left and below: The Wick Family house. It turns out that she lives just outside of New York City and we were able to coordinate both a visit and a stopover point to take a train into the city from her house. 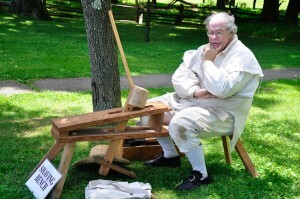 Knowing that the Dudes would probably not want to watch two old ladies catch up on old times, she suggested that we go to Jockey Hollow in Morristown, New Jersey for a hike and to see another chapter in Revolutionary War History. No one really knows how the term Jockey Hollow came about but it became the name for the site of a winter encampment of George Washington’s troops in the winter of 1779-80. It is also on record as one of the worst winters in Morristown’s recorded history. 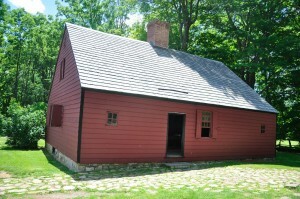 above: One of the reproduction cabins used by higher ranking soldiers in 1789. The site was chosen because of it’s location between Philadelphia and New York and its elevation which gave the continental troops the strategic advantage of having the formidable high ground. It also gave them the ability to watch British troop movements. 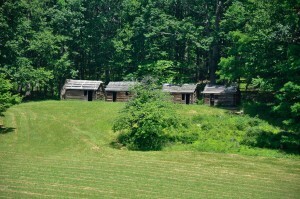 Once there, the troops took over the farmland and built over 1000 small cabins which housed 12 men each. The conditions were severe but Washington’s troops emerged from that winter as a cohesive and disciplined fighting unit. I don’t remember any of this from history class but Morristown has been characterized as the “military capital of the American Revolution”. left: A row of soldiers cabins, imagine a thousand of these! 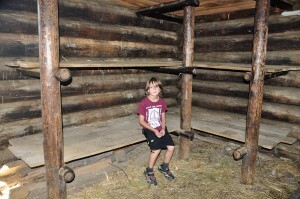 right: the Lil’ Dude checks out one of the bunks. The Visitor’s Center film filled in those bits of information I missed in history class and the grounds still contain structures that were present during the winter of 1789. 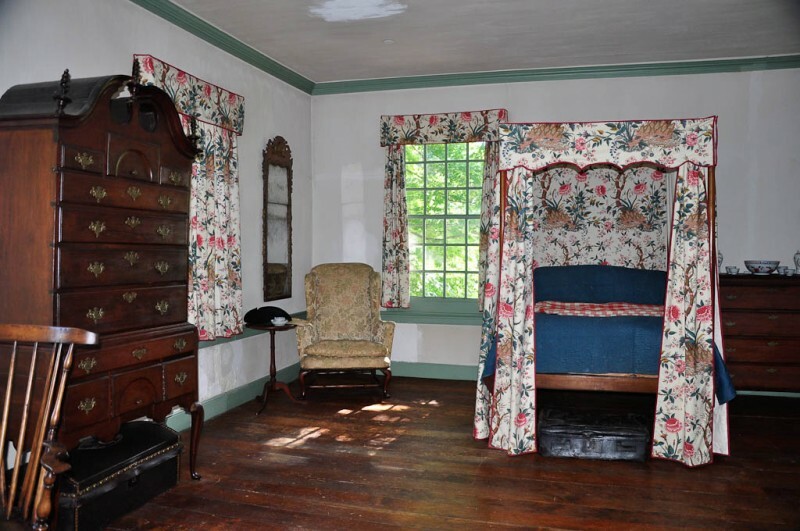 We toured the Wick family house which was used by officers during that time and volunteers in period dress and character were available to answer questions. 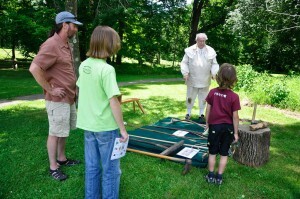 left: A volunteer teaches us about farming implements from the 1700′s. 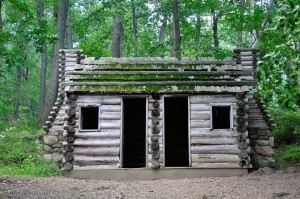 We then hiked one of the several hiking trails on the site to reproduction cabins where the troops lived. 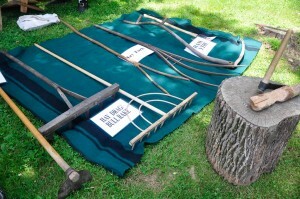 The originals were dismantled and used for other purposes after the troops moved on. 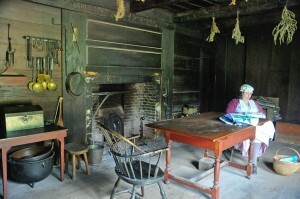 The 12 ft x 16 ft quarters were minimal with dirt floors and one small fireplace for heat and cooking. 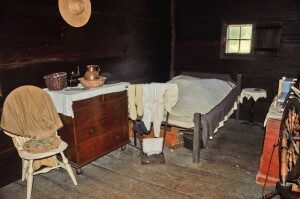 The three tiered bunks were made of wood and would be lined with straw. The men were given one blanket to keep warm. It struck me as a brutal “camping experience” that any of them were lucky to survive. But survive they did with few casualties and went on to epitomize the resolve of the American people as they fought for Independence. 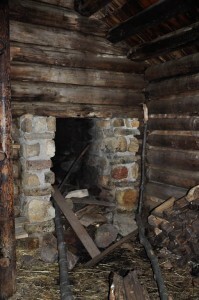 above: A primitive source for heating and cooking in the cabins. Across town is the Ford mansion where George and Martha Washington made their home during this time along with the Ford family and numerous servants. 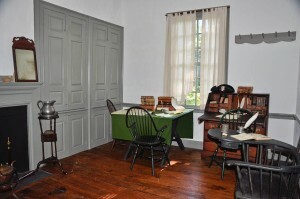 It also served as the headquarters for Washington and his officers. 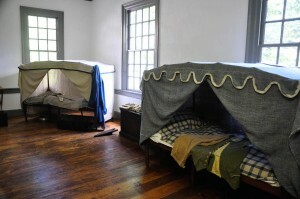 left and below: Sleeping quarters inside the Ford Mansion. 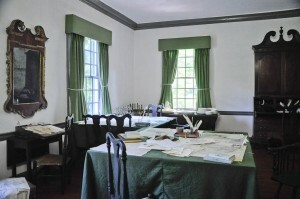 right: Washington’s strategic planning room and dining room within the Ford mansion. It gives me chill bumps to think about all that happened in that house. Oh, if walls could talk! And, with all of the places that claim “Washington slept here”, it was fun to actually visit a place where he really did sleep! This entry was posted in Dawn Deliberates and tagged friends, New Jersey. Bookmark the permalink. 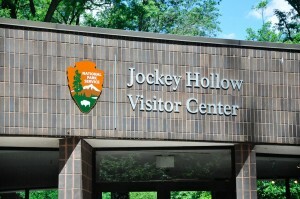 We visited Jockey Hollow many times by ourselves and with visitors when we lived in Lebanon, NJ only a few short miles from there. It sounds as if it has been added to in many nice ways since we were last there. I felt the same way as a visitor there, imagining the lives of the men who were encamped there during that awful winter. Just caught up on your four latest blogs! As usual, I enjoyed the learning experience, and pictures, but am most thrilled for you to have had the chance to catch up with “old” friends! You continue to make the very most of this very special year.